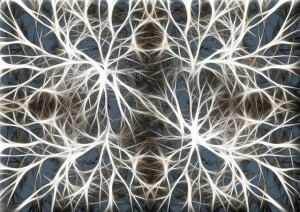 Fortunately, a number of techniques have been developed over recent years that allow us to manipulate the activities of specific brain cells under controlled conditions. 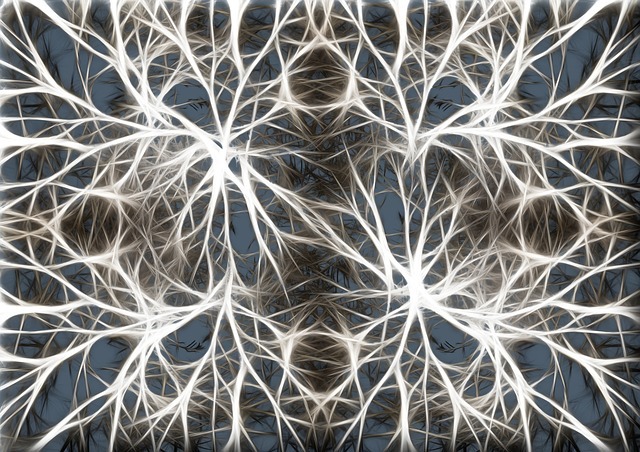 A method which has received a lot of attention is optogenetics, which involves shining light through optical fibers implanted in the brain to switch ‘on’ or ‘off’ neurons or circuits. Optogenetics has been widely used for studying how different circuits control behavior in animal models, and one study used it to restore vision in blind mice with retinal damage. Newer approaches involve pharmacogenetics, where neurons are genetically engineered to respond to specific drugs which can be administered locally or systemically. Another method that has been used therapeutically, particularly in treating Parkinson’s disease, is deep brain stimulation. Deep brain stimulation involves implanting thin wires called electrodes into specific brain regions and using them to deliver electrical impulses to these regions. A problem with many of these techniques is their invasiveness. 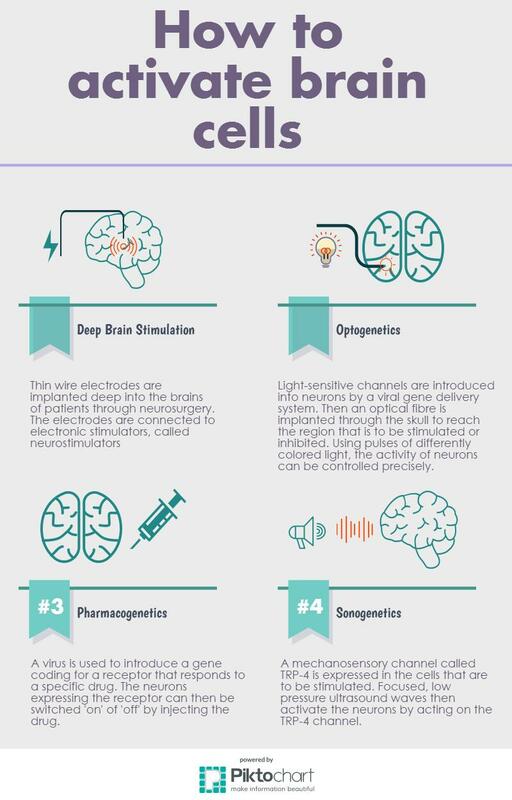 Optogenetics involves implantating optical fibers, while deep brain stimulation requires introducing electrodes into the brain– both procedures require neurosurgery. If the fibers or electrodes move from their target positions, it can have unintended side effects and damage nearby cells. Both optogenetics and pharmacogenetics involve viral gene delivery systems, which require further optimization and safety measures. The scientists at Salk institute tried to avoid some of these problems by using ultrasound waves (the same sort of sound waves that are used for sonography in humans) to probe neurons. Low pressure ultrasound waves do not harm living tissue, can pass unobstructed through thin bone and flesh, and do not cause overheating or membrane damage. The technique also offers high resolution – in their experiments, the scientists used a system for generating ultrasound waves that could be focused to an area of diameter as small as 1 mm! For their studies, the scientists used the small roundworm, C. elegans. Since the early 1960s, this tiny, transparent worm has been used widely for developmental, genetic and neurobiological studies. It was the first multicellular organism to have its entire genome mapped, and the first to have a complete connectome (a map of all its neurons and how they connect to each other) prepared. Every cell in the adult worm’s body has been identified and fate-mapped, including all 302 of its neurons. In this study, the researchers placed C. elegans worms on agar plates, and placed the plates in an isolated chamber where ultrasound waves could be focused to a narrow area. The setup was also equipped with a camera to record the behavior of the worms upon receiving ultrasonic stimulations. Now, these worms may be tiny and lack proper circulatory or respiratory systems, but they are quite capable of exhibiting simple, repeatable behaviors. Two kinds of movements can be easily studied – reversals, which occur when the worm starts moving backwards, and omega turns, when the worm executes a very sharp head turn, rather like a U-turn on a motor vehicle. The scientists found that when these worms were bombarded with ultrasound waves, they increased reversals and omega turns. This effect was observed only when gas-filled microbubbles were artificially introduced in the medium around the worms. Such microbubbles have been used previously to amplify ultrasound signals in a mechanical fashion and enhance contrast during ultrasonography in humans. In this case, the microbubbles expand and collapse on being hit by ultrasound waves, pressing against the skin of the worms around them. Since it was clear that mechanical amplification of the ultrasound waves was needed to change the worm’s behavior, the scientists hypothesized that a mechanosensing mechanism (i.e. 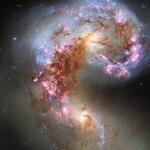 a system which senses the amount of pressure acting on it) on the worm’s skin could be responsible. An ideal candidate for carrying out this mechanosensing was a protein called TRP-4, which belongs to the same family of pore forming proteins as those in our inner ears that help us hear. 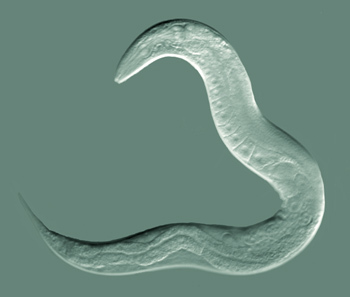 TRP-4 is expressed by a grand total of 8 neurons in the C. elegans, all of which have been identified. So, the scientists asked, what would happen if this channel were to be removed? Genetic deletion of the TRP-4 protein from the worms resulted in significantly reduced large reversals by the worms at certain ultrasound frequencies, although omega turns were not affected. This led to the conclusion that TRP-4 channels were probably responsible for the large reversals caused by ultrasound stimulation in these worms. Since TRP-4 was found to be sensitive to the ultrasound waves, the authors went one step further, and cloned this gene into neurons that do not normally express TRP-4 before stimulating the organisms with ultrasound and noting the response. Surprisingly, they found remarkably varied responses upon expressing this gene in different neuronal types – while some neurons, when stimulated after expressing the TRP-4 channel, increased the number of reversals, others actually showed a decline in reversals. Perhaps most interestingly, when expressed in a neuronal population that lies 25 microns interior to the skin surface and does not contact the skin in any way (remember that the microbubbles pressing against the skin of the worm was necessary for the effects of ultrasound earlier), ultrasound stimulations were sufficient to cause a significant increase in the number of omega bends. The results are highly exciting and the authors express hope that the system may be adapted for use in other species as well, including vertebrates and humans. Since low-pressure ultrasound waves are non-invasive, and can pass easily through brain tissue, they can be used to specifically target deep brain regions. Since there are no homologs of TRP-4 in humans or rodents, chances of side effects are also low, and by combining the process with gene therapy, very specific neuronal populations can be stimulated. One possible limitation is the necessity of microbubbles for suitable amplification of the ultrasound signal. However, these have been injected previously into mice and humans in moderately high concentrations with no harmful effects. The field of sonogenetics may only be beginning, but it holds a lot of promise for neuroscience researchers as well for neurological therapy worldwide. Reference – Ibsen S, Tong A, Schutt C, Esener S, Chalasani SH. Sonogenetics is a non-invasive approach to activating neurons in Caenorhabditis elegans. Nat Commun 2015;6:8264.